As a HubSpot user for over two years now, I’ve been through a lot with the platform. From learning its basic tools, to being wowed by updates and integrations, HubSpot has rarely disappointed me in our time spent together. Working with HubSpot has made me appreciate the numerous amount of different features it offers. From email services, to blogging templates, creating unique landing pages and monitoring website traffic, HubSpot is a truly my most useful marketing tool. However, there are a couple of tools inside the platform that I feel I just can’t live without anymore, and I want to focus in on those. Discover the five top HubSpot features and why I believe you should be using them. With all of these efforts in one place, your campaigns can be tracked and run smoothly with no hesitation. Other suggestions include having the proper length for meta description, including an image with alt text, having a form and at least 1 internal link. The SEO view feature allows you to track which steps you’ve completed and which you still need to finish to optimize your page. In marketing, testing is a daily, weekly, and monthly part of campaign planning. With HubSpot, testing is made easy with their Pro tool, A/B Testing. This feature allows you to test two different options for the following tools: offers, copy, email sender, image, subject line, and whole email. Ever wonder which subject line is more compelling? A/B testing allows you to send an email to a percentage of your contacts, choose a minimum time of 1 hour to test open rates by delivered, and the remaining percent of your contact list will receiving the winning subject line. With offers, copy, and images, you have the ability to test the style and review the conversion rate to find the most influential version. A/B testing is an efficient and quick way to start testing different assets without constantly changing your campaigns. With all of the social tools out there today, keeping up with your inbox can be a timely task. HubSpot’s Social Inbox tool is the easiest way to keep track of all your social engagements. Monitoring keywords, phrases, brand names and specific twitter handles right inside HubSpot allows you to quickly take social action and engage. This helps humanize your brand and take your engagement to the next level. Being able to easily catch leads and potential customers who are chatting about your product takes away from endless searching and monitoring on multiple social platforms. 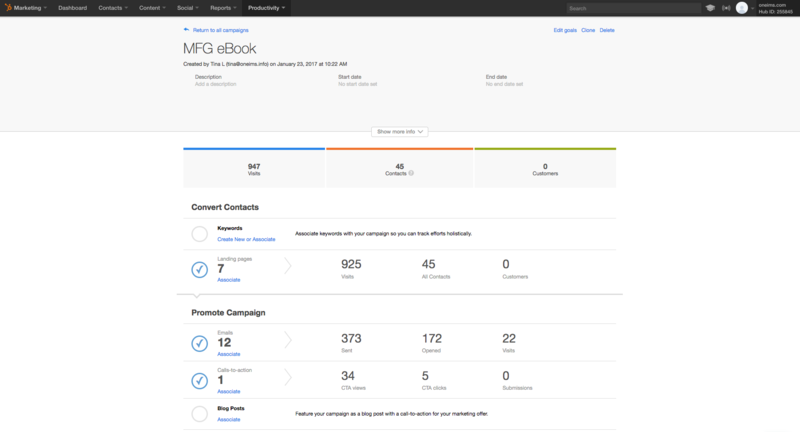 One of the newest HubSpot tools, The Projects tab has become extremely powerful for a smaller group of marketers. Projects allow you to document and perfect a repeatable process that you can stick to. HubSpot not only provides dozens of cheat sheets, but you can create your own. This tool is replacing some of the more common task assigning tools, like Wrike, Basecamp, and more. It allows you to assign dates and people to specific tasks, making everyone accountable for their assignments. HubSpot is obviously so much more than the five tools I talked about above. Sometimes though, with all the noise of the hundreds of marketing tools we can use, simplifying some of the best features helps to differentiate one from another. Tell me, what’s your favorite tool inside HubSpot and why?